This letter from the Siamese minister of external and trading affairs, the Phrakhlang, to Governor General Antonio van Diemen (in office 1636-1645) and his Councillors in Batavia is a good example of “maritime diplomacy”: high level diplomatic correspondence between two thalassocracies (VOC Batavia and Siam) or maritime states to promote matters of common interest, or settle disputes concerning their maritime trading activities or spheres of influence at sea. In 1641, the “zenith of Dutch –Siamese diplomatic exchange” was already over. The contacts between the Siamese kings and the Princes of Orange and the splendid receptions of four important Dutch embassies at the Siamese court took place during the period 1628-1641. In 1641 the last missive and gifts from the Prince of Orange to the King of Siam were received in Ayutthaya with splendour and honour, under the supervision of Dutch executive head Jeremias van Vliet. For the Dutch, the year 1641 marked above all the final conquest of Portuguese Malacca, and subsequent control over the Straits of Malacca. In this letter King Prasatthong (via the Phrakhlang) presents himself as a ruler who stands in a long tradition of participating very actively in the intra-Asian overseas trading networks. The royal junks of Siam had been active in the South China Sea and in the Indian Ocean for a long time. Siam had sent thirty-six tribute missions to the Ming rulers between 1371 and 1404 and twenty-two in the Yung-lo reign, 1405-33. Siamese junks could thus frequently be seen in the South China Sea. Until around 1450 Siam’s maritime power competed mainly with Java and Champa, until the rise of Malacca under Sultan Mansur Shah (r. 1459-1477), when Malacca dominated the maritime Southeast Asian scene. The Portuguese conquest of Malacca in 1511 was probably favourable for Ayutthaya in the beginning. It became an alternative port for Muslim traders and others. It also became a nodal point for Chinese trade to the Philippines and Borneo, until disaster struck and Ayutthaya, the greatest port city of Southeast Asia in the middle of the sixteenth century, was conquered by the Burmese in 1569. Direct Chinese shipping to Southeast Asia and the rise of Banten contributed to Ayutthaya’s decline. The rise of the European trading companies, in particular the Dutch United East India Company (VOC, 1602), signified another challenge for Ayutthaya during the subsequent 1600-1688 period. European cargo ships could carry more over a longer distance for a cheaper price, and soon the Europeans also monopolized crucial products in the business chain, such as fine spices (nutmeg and cloves) from the Moluccas. Dutch Batavia and Spanish Manila became two major international competitors, while the Portuguese remained active in Macao. Ayutthaya became more and more focused on the China trade, and attracted all those traders who were excluded by Dutch monopolies: the English, the Portuguese, the French, the Muslims from India, and the Malays from Malacca and the main Sumatran ports, Jambi and Palembang. Although Ayutthaya was quite active in the export trade with Japan – consisting of deer- and cowhides, sappanwood, rayskins and elephant tusks – the Siamese participation in Siamese-Japanese shipping declined during the second quarter of the 17th century. It is in this context of a declining trade that in 1640-41 the King permitted a Siamese governor to fit out a junk to Batavia to sell rice and lead for the King. The letter itself contains two requests from the King: 1.) 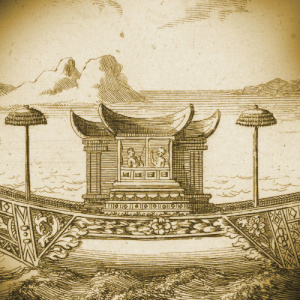 Batavia’s help to find a Siamese junk stolen by its Chinese nakhoda; and 2.) a model ship for his son to play with. The first request delivers interesting information on the size of what seems to have been an ordinary Siamese junk, and an example of what a regular crew of such a common Siamese ship looked like. The ship itself measured 34.31 x 6.11 meters and had a mixed crew of 61 men, of whom 26 were Chinese and 22 Muslim (Indians) and Malays. The junk was not supervised by a Siamese nakhoda but by a Muslim Malay skipper, employing a Chinese as his second man. The chief helmsman was a Muslim Chinese and also the boatswain was a Chinese. The Siamese on board were a chief trader with two assistants, and only 11 Siamese crew members. This confirms the notion of for instance Ishii Yoneo that the royal junk’s “operations at sea seem to have been exclusively in the hands of non-Siamese”, while the trade itself was left to a few Siamese traders on board. This involved a certain risk, as the letter demonstrates. These data, as well as the data on the weaponry on board, offer us a glimpse of how Siamese junks operated. In terms of variety of crew and military hardware, these relatively small junks seem to have been much more vulnerable than the European, better armed cargo ships at that time. It is in this context that the king of Ayutthaya frequently requested the assistance of the VOC when calamities occurred. Bhawan Ruangsilp, Dutch East India Company Merchants at the Court of Ayutthaya: Dutch Perceptions of the Thai Kingdom, c. 1604-1765 (Leiden/Boston: Brill, 2007). Ishii Yoneo, “A Note on the Čhām Diaspora in the Ayutthayan Kingdom, in: Geoff Wade and Li Tana, Anthony Reid and the Study of the Southeast Asian Past (Singapore: Institute of Southeast Asian Studies, 2012), pp. 241-245. Reid, Anthony, “Documenting the Rise and Fall of Ayudhya as a Regional Trade Centre”, in: A. Reid, Charting the Shape of Early Modern Southeast Asia (Singapore: Institute of Southeast Asian Studies, 2000), chapter 5, pp. 85-99. Hendrik E. Niemeijer, “Letter from the Phrakhlang on behalf of King Prasatthong (r. 1629-1656) to the Supreme Government in Batavia, 2 March 1641”. In: Harta Karun. Hidden Treasures on Indonesian and Asian-European History from the VOC Archives in Jakarta, document 21. Jakarta: Arsip Nasional Republik Indonesia, 2016.